NORTHERN WATER’S BRIAN WERNER (left) led a Water Fluency class site visit in May, which included a peek at Northern’s conservation garden along with features of the Colorado-Big Thompson Project. CFWE’s newest program successfully launched in spring when we admitted 32 community leaders who desire to “speak fluent water.” This diverse group of participants includes local elected officials, regional planners, rural water operators and special district board members. All are committed to better navigating the culture and complexity of water policy and management. Over several months in various sessions, the cohort is learning through online materials, exclusive site visits and facilitated group discussions. Water Fluency participants are posing difficult questions on how to solve local and statewide water challenges, while expert speakers and instructors equip them with knowledge and tools to lead with confidence. Congratulations to the inaugural 2015 Water Fluency class for your commitment to shaping the future of Colorado! Water Fluency is made possible through the generous support and guidance of our partners—the Colorado Water Conservation Board, Special District Association of Colorado, Colorado Water Resources and Power Development Authority, Douglas County, Jefferson County, Denver Water, South Metro Water Supply Authority, and Northern Water. Contact kristin@yourwatercolorado.org to receive advance notification for dates, location and registration for the 2016 course. VINE TO WINE TOUR On July 24, join CFWE’s Water Leaders, Colorado Mesa University’s Water Center and Colorado Water Congress’ POND group to explore both vineyards and irrigation operations, and how they relate to recovering endangered species in the Grand Valley. The tour will culminate in a wine tasting. URBAN WATERS Bike Tour participants got an on-site overview of the Chatfield Reallocation Project from Rick McLoud of the Centennial Water and Sanitation District in June. “The Great Divide” Film Tour CFWE is proud to partner with Havey Productions to host portions of “The Great Divide” film tour, which begins with its premiere Aug. 6 at the University of Denver’s Newman Center for the Performing Arts. “From Ancient Puebloan cultures and the gold rush origins of Colorado water law to agriculture, dams, diversions and conservation, the film will reveal today’s critical need to cross ‘the great divide,’ replacing conflict with cooperation,” say the filmmakers. Screenings and lectures will continue through November. See www.thegreatdividefilm.com for dates and locations near you. Water is still one of the lowest-priced utilities on the market, but what and how we pay is changing. O U R CO N T R I B U T O R S After mowing and watering lawns in a small Colorado town when young, Allen Best knew a little about the connection between land use and water. And while researching his story for this issue (“From the Ground Up,” page 17), he studied the residential landscapes of water-parched Albuquerque. “The sight of endless front yards of gravel left me cold,” he says. “In Colorado, we have to figure out how to strike a better balance.” Allen writes for Planning Magazine, The Denver Post, Colorado Biz magazine, and High Country News. He also publishes Mountain Town News, which can be found at mountaintownnews.net. Writing from Fort Collins, Joshua Zaffos is a contributing editor for High Country News and his recent work has appeared in Slate, Nature Conservancy Magazine and other outlets. Reporting on the integration of land and water planning (“Connecting the Dots,” page 23), Zaffos found himself conducting multi-person interviews with utilities managers, city planners, and water conservation specialists. He says, “A lot of communities recognize the walls and divisions that complicate efforts to integrate land and water planning, but several are clearly working to communicate across departments on this challenge.” More of Josh’s work can be found at joshuazaffos.com. Nelson Harvey is a freelance print and radio journalist based in Denver. He has written stories about food, agriculture and the environment for publications like High Country News, 5280, Health News Colorado and others, and he was formerly the editor of Edible Aspen Magazine. While writing for this issue (“Show Us the Water,” page 31), Nelson was surprised to learn how much today’s land use decisions will affect Colorado’s water supply for decades to come. More of his work can be found at NelsonHarvey.com. Matthew Staver is an editorial, documentary and commercial photographer living in Denver. He’s a third-generation Colorado native, a second-generation photographer and first to jump at an opportunity to spend some time on a farm. For this issue, he visited developments old and new in booming Douglas County (“Show Us the Water,” page 31), as well as the xeriscape garden outside Aurora’s municipal center (“Connecting the Dots,” page 23). His photographs have been published in TIME magazine, Newsweek, Smithsonian, and on the cover of The New York Times on multiple occasions. Find his work at www.matthewstaver.com. Greg Poschman is a native Coloradan, photographer and filmmaker, who advocates for healthy rivers and riparian areas across the state. He spent time in his home turf of the Roaring Fork Valley to document growth and water efficiency for this issue (“Connecting the Dots,” page 23). Connect with Greg and his production company, Moving Media, at greg@coloradocameraman.com. THE MISSION of the Colorado Foundation for Water Education is to promote increased understanding of water resource issues so Coloradans can make informed decisions. CFWE is a non-advocacy organization committed to providing educational opportunities that consider diverse perspectives and facilitate dialogue in order to advance the conversation. HEADWATERS magazine is published three times each year by the Colorado Foundation for Water Education. Its goals are to raise awareness of current water issues, and to provide opportunities for engagement and further learning. THANK YOU to all who assisted in the development of this issue. Headwaters’ reputation for balance and accuracy in reporting is achieved through rigorous consultation with experts and an extensive peer review process, helping to make it Colorado’s leading publication on water. ee anything different in this issue of Headwaters? Our regular readers may notice that the page count has increased to allow for larger photos and more white space, the layout is slightly modified due to the vision of a new graphic designer, and we’ve increased the use of illustrations to help communicate content differently. Keeping the design fresh and readable is a high priority for CFWE, and I am very pleased with how these small changes Nicole Seltzer (second from right) leads the CFWE staff team, pictured left to right: have added up to a great final product. Jennie Geurts, Jayla Poppleton, Caitlin Coleman, and Kristin Maharg. A more substantial, though less obvious change, is the topic to which we decided to dedicate this issue. CFWE is a water education organization, so why are we focusing content on land use and development? The short answer is because water touches everything. There is a water management nexus with a multitude of other public policy issues, such as land use planning, energy development, transportation infrastructure, health care. The list goes on. CFWE’s newly revised organizational strategic plan calls for our work to “help decision makers understand water’s relevance to diverse public policy challenges by examining water through a wider lens.” In the future CFWE’s content, which includes Headwaters magazine, will ”zoom out” from water and explore how its management and protection is influenced by the other issues that face Colorado’s decision makers every day. We believe this will foster more and deeper conversations about water, and ultimately aid us in our goal to enable all Coloradans to speak fluent water! Headwaters is just one way that CFWE teaches Coloradans about water issues, but it is a centerpiece of our educational efforts. Each issue takes hundreds of staff hours, dedicated volunteer efforts from an expert peer review group, and more than $15,000 in writing, design, printing and mailing costs. Beginning with this issue, CFWE will make a dedicated effort to ask our readers to support production of this important resource through CFWE membership or, if you are already a member, additional support of our new Headwaters Fund. Headwaters, in my opinion, is one of the best water publications in the United States. As printed content becomes increasingly rare in this digital age, and as the country’s traditional media struggle to provide in-depth coverage of topics like water, Headwaters will continue to stand out for its high-quality journalism and approachable formatting. If you find value in Headwaters, please consider financially supporting CFWE to ensure it continues into the future. Finally, I would like to wish all of our readers and supporters a relaxing and fun summer. Here at CFWE, our summer plans include exciting international travel, lots of home-grown produce, time to enjoy our favorite rivers, and numerous water education events across Colorado. Make sure to read about our upcoming opportunities in the preceding pages, and visit yourwatercolorado.org to brush up on your water knowledge to impress your friends at those backyard barbecues! 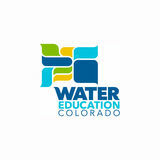 Thanks for your support of water education in Colorado! CATTLE RANCHER, GRAPHIC ARTIST After 12 years and 37 issues, Emmett Jordan has passed the torch for Headwaters’ graphic design…we pay tribute to his many contributions. ust before Denver’s City Council elections in May, candidates sat down with constituents to discuss views and together build a city. As they envisioned Denver’s future, attendees voiced concerns about gentrification, affordable housing, and an aging population, among others. Heads nodded in agreement as the Q & A continued— this group was in accord, and I was with them. I had spent the past month looking for housing in a competitive market. Moving only a few blocks, my rent increased 50 percent over what I paid for the apartment I took four years before—even at that, it was the best deal around. Nobody asked the city council candidates about water. We agreed that these were our issues. Other cities and counties have a different roll of concerns for decision makers to tackle. For some rapidly growing communities, water supply is at the top of that list, but how it’s addressed is determined, in part, by local visioning documents that set guidelines for future growth. These master plans, or community comprehensive plans, espouse values that run the gamut to include priorities like quiet and peacefulness; building a sense of community; fostering diversity of people and customs; protecting rural character; ensuring that new development is served by adequate infrastructure; and others. Elected officials, planners, and citizens have a lot on their minds! It’s stunning to read a master plan and to realize that it’s just scratching the surface. Some don’t even mention water. Despite our constant reliance on the resource, not all city councils, developers or homeowners are thinking about where their water comes from or how its use could be maximized through efficiencies. Sometimes we’re so consumed with other facets of life that we hardly notice when water pours from the tap. But comprehensive plans lay the groundwork for communities to continue morphing into the places they aim to be. They create sideboards to solve pressing issues—and water is one of them. Although plans cover a lot, there’s an opportunity—and some experts say a need—to increasingly consider water and land use together. Perhaps more conjunctive planning on these fronts could help communities minimize the need to procure new water supplies from other sectors or regions, which many agree have broader, less appealing consequences. Statewide, this conversation has been gaining attention. Demands on Colorado’s water supplies and predictions for growth haven’t eased, and talk of the need to make this connection between water and land use has become increasingly salient since the first draft of Colorado’s Water Plan was released last December. The revised draft, released in mid-July, was at press time expected to call for conserving 400,000 acre-feet of water per year as a state by 2050, an increase by 60,000 acre-feet over the “medium-level” goal of water conservation established in the first draft. Land use strategies that reduce water demand are one path to achieving that higher goal. If successful, Coloradans could reduce forecasted municipal water demand by enough to keep roughly 200,000 irrigated acres of farmland in production, or to avoid building an additional transbasin diversion. At CFWE, we felt the time was right to tackle some of the sensitive issues around water and growth in Headwaters, and to take a look at cases where land and water decisions are being strategically integrated. We wanted to provide a toolkit of sorts, while elevating the discussion of how entities could build on these best practices to go further. 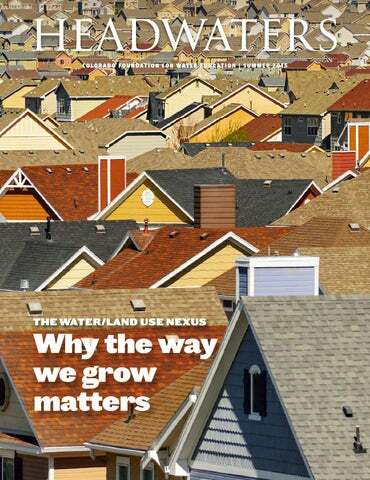 In this issue, we invite you to explore the nexus of land use and water, opportunities to merge these fields of planning, and protections to ensure the adequacy of water supplies—for both those who call Colorado home today and tomorrow. More than 1,100 acres of the 4,100-acre Stapleton redevelopment community at the site of the old Denver airport will be dedicated to parks and open space at build-out. The naturally vegetated Westerly Creek greenway (foreground) provides flood retention and water quality benefits as well as bike and walking trails, which continue into the 80-acre Central Park (midground). Construction at Stapleton has continued for more than a decade, with a total of 12,000 homes and 4,000 apartments planned at completion. While designed to save water, with closely grouped houses and modest turf coverage at residences, actual water savings on a neighborhood scale have yet to be measured. CHEAP WATER may be under-appreciated by consumers and developers, while prices that ratchet up for increased use can stimulate behavior change—and demand for housing like this WaterSense home with xeric landscaping in Colorado Springs. CFWE FRIENDS AND SUPPORTERS gathered at Denver’s Space Gallery in May to celebrate water education and this year’s award recipients. 2015 PRESIDENT’S AWARD To honor the great men and women of Colorado water, the Colorado Foundation for Water Education annually recognizes two exemplary leaders who demonstrate above-and-beyond commitment to water resources stewardship and education. In 2015, CFWE is proud to honor Jim Lochhead with its President’s Award for lifetime achievement in water education and Greg Kernohan with its Emerging Leader Award. The awards were presented during CFWE’s annual reception on May 8 at the Space Gallery in Denver. DENVER WATER MANAGER Jim Lochhead (center) receives the 2015 President’s Award from CFWE board president Gregg TenEyck (left) and vice president Justice Greg Hobbs. Jim Lochhead—2015 President’s Award Honoree When I was young the waters sang of being here before I am, of falling sweet and soft and slow to berry bog and high meadow. of Reclamation. At stake was the right to protect the waters of Green Mountain Reservoir, a compensatory feature of the 1937 Colorado-Big Thompson Project, for the intended Western Slope water uses. Denver attempted to usurp the ability of Summit, Grand and Eagle County communities to utilize Green Mountain releases to offset diversions on Colorado River tributaries above the 1903 Shoshone run-of-the-river hydroelectric power water right in Glenwood Canyon. Jim and colleagues won that case against Denver in a 1991 decision by the 10th U.S. Court of Appeals. A revolution in Colorado water was occurring at the same time. The federal courts upheld the U.S. Environmental Protection Agency’s veto of Denver Water’s Two Forks transbasin project. The Denver Water Board doubled up. It hired Chips Barry from his position as executive director of Colorado’s Department of Natural Resources, and it set his engaging embrace loose. The mystery of a Divide is this, you can stand on opposites and not lose your balance, half of you belongs to the other ocean. Chips helped renew Denver and Colorado, implementing several master water exchange stipulations negotiated by Jim and colleagues benefiting western and eastern Colorado. These agreements respect the superior right of Western Slope water uses, even as Denver Water won the ability to firm up water for its million-plus customers. Queen City meets Mountain Stronghold! Jim also proved his water diplomacy mettle as a member of Colorado’s Water Conservation Board. From securing instream flow water rights for preservation of Colorado’s environment to protecting its interstate water compact entitlements for present and future use, he excelled. He became Chips’ successor as executive director of Colorado’s Department of Natural Resources, following Clyde Martz and Ken Salazar, and served as Colorado’s commissioner for the Upper Colorado River Compact Commission. His subsequent law practice partnership with the Brownstein Hyatt Farber Shreck law firm extended his interstate reach to matters involving the Great Lakes Compact, Idaho’s Snake River Basin Adjudication, and New Mexico’s effort to comply with the Pecos River Compact with Texas. GREG KERNOHAN RECEIVES the Emerging Leader Award from CFWE president Gregg Ten Eyck. HOUSING DEVELOPMENT pushes into farm country in Colorado’s Weld County, shown here in 2010. From the Ground Up Colorado’s rapid growth offers a golden opportunity to merge water and land use. and hundreds of miles to the Front Range urban corridor. Infrastructure costs would be enormous, opposition prickly, and the longterm availability uncertain. In examining 112 climate model projections, the 2012 Colorado River Basin Water Supply and Demand Study found an average 9 percent decline in long-term average flow of the Colorado River, at least partly the result of increasing temperatures, with a quarter projecting an even greater decline of 16 percent. This brings the conversation back to conservation, and how to do more with less. An assortment of water-saving activities have been embraced and promoted by the state’s water providers over recent decades with much success. However, state water planners and environmental advocates say one strategy remains largely untapped, and that is to use the mechanisms of land use planning to build in water efficiency at the outset of all the forecasted new growth. estern Slope communities are insistent that land use must become a larger part of the conversation as the state continues to grow. Most striking is the statement by the Durango-based Southwest Basin Roundtable, which calls for a statewide shift in residential water use. Now, it’s commonly 50 percent indoor and 50 percent outdoor use for single-family homes when considered on an annual basis, according to a common metric used by water organizations. The Southwest Basin Roundtable maintains that this needs to be shifted to 60 percent indoors. That doesn’t mean more water use indoors, but rather a substantial reduction of outdoor use. The roundtable wants an even higher standard of 70 percent indoor use for projects enabled by additional transbasin diversions or agricultural dry-ups. In Aspen and Pitkin County, additional transbasin diversions from the Fryingpan and Roaring Fork River basins remain a lively worry. Two transbasin diversions there still have conditional water rights. Like the Southwest Basin Roundtable, local leaders in this stretch of the Colorado River‘s mainstem believe communities that would pursue transbasin diversions to enable growth should first be accountable to addressing water demand reductions when it comes to how they plan for and regulate that growth. Laura Makar, assistant county attorney for Pitkin County, says that the first draft of Colorado’s Water Plan aimed too low in its treatment of land use. “It needs to be a stronger section for the water plan,” she says. “Land use drives the timing, location, The 2009 California Water Plan Update showed that a 20 percent increase in density could yield a 10 percent water savings. high-efficiency faucets, showerheads and toilets will be installed. “It’s not over the top or Draconian,” says Scott Carlson, a member of the family developing the property. “We try to make small, reasonable concessions across the entire water use spectrum.” The developer gets lower tap fees, giving the homeowners correspondingly lower-priced homes—and, forever more, lower water bills. Mark Marlowe, Castle Rock’s utilities director, says the water-efficiency plans are expected to result in new town lots consuming anywhere from 26 to 47 percent less water than those developed in the late 1990s. Looking ahead, the most significant growth will occur in what might be called the Colorado Boulevard Corridor of Adams and Weld counties. The street bisects the old coal-mining towns of Dacono, Frederick and Firestone before continuing on into corn and wheat fields and, a few miles later, Johnstown and Milliken. Firestone grew 436 percent during the century’s first decade, tops in Colorado, and Frederick was close behind. No slowdown is expected. Now at 12,000, Firestone expects to hit 60,000 to 65,000. “Water we need at build-out does not exist today,” says Wesley LaVanchy, the town manager. To prepare, Firestone, along with Dacono and Frederick, has a state-approved water conservation plan on file, even though it wasn’t required for water providers operating at such low volumes. LaVanchy points to successes in ratcheting down water use in town parks by 22 to 24 percent and also close scrutiny as Firestone seeks to “foster great communities but at the same time reduce our footprint.” But under such circumstances, one might wonder whether a statewide paradigm shift is needed about what constitutes build-out: Is it when the land runs out or the water? useful for establishing baselines and setting clear water use reduction targets in planning documents. This absence was detected even in the 2010 Statewide Water Supply Initiative report. Such data, the document noted, would be “necessary so that developers and city and county planners can understand what the best management practices and methodologies are, and reliably how much water savings they could expect.” Pitkin County and others go beyond and envision a clearinghouse for best practices. MAYTAG RANCH blends the two with its 50- and 100-acre home sites plus working cattle ranch in Fremont County; ranch participation is one amenity for owners. sections in its land development code to bolster agriculture while protecting private property rights. “Nothing in the code prevents a landowner from taking prime farm ground out of production, but there are provisions in the code that can help minimize this loss,” says Tom Parko, director of planning services in Weld County. The county recommends, for example, that lots divided in an agricultural zone be located on the corners of a property to reduce interference with crops and irrigation pivots. And since 2010, lots smaller than 35 acres can not be further subdivided without going through the county’s “re-subdivision recorded process.” This has kept some irrigated property in production and minimized land divisions, Parko says. Agriburbia and urban gardening are additional concepts that transform underutilized land into farmland, growing food close to the population base either on designated farmland, in developments, or in unused spaces such as under power lines or in vacant lots. Although local food security is advanced, it’s a different concept than maintaining large-scale agriculture and preserving rural economies. Even with strong advocates, some agricultural land will go. Frank estimates around 20 percent of the South Platte’s irrigated acres are already owned by municipalities but have been kept in production until the water supply is needed. Water-smart land use patterns that reduce per-capita water demands for new developments could slow the continuation of that trend. Four Ground-Up Methods for Saving Water The Keystone Policy Center’s Colorado Water and Growth Dialogue is modeling four water-efficient land use patterns for new development to measure the water savings that could result. The project will also explore zoning regulations and other management levers communities could use to accomplish these patterns and lessen water demand for new growth. SMALLER RESIDENTIAL LOTS Studies have found water savings from 10 to 60 percent with increased density of single-family residences, primarily due to the reduction of irrigated lot area. Savings continue to grow as lot sizes shrink, but taper off after reaching between seven and ten dwelling units per acre. MOVING FROM SINGLE-FAMILY TO MULTIFAMILY DEVELOPMENT Some of the same studies noted in No. 1 suggest that multifamily units consume as much as 35 to 50 percent less water than single-family detached units. INCREASING MULTIFAMILY RESIDENTIAL DENSITY Higher density multifamily housing also produces water savings, but the trend reverses eventually. For high-density or high-rise condominiums above three stories, cooling towers or waterintensive amenities may negate part of the water saved on irrigation. Local Affairs, to develop and offer free trainings to local planners and water providers about what constitutes best practices in merging the two realms. Numerous providers will be impacted by the new law: Of the 70 or so water conservation plans currently on file, only a handful specifically call out land use planning strategies, says the CWCB’s technical conservation specialist Kevin Reidy, who will be updating planning guidance documents and working with DOLA’s Community Development Office to plan trainings in response to the new directive. The Keystone Policy Center is also trying to move the conversation along through its Colorado Water and Growth Dialogue. Since early 2014, the dialogue has convened meetings of 25 individuals from the land and water planning fields as well as economic development organizations. Their charge is to identify land use patterns and incentives that will save water and still deliver housing products that consumers find attractive, says the Keystone Center’s Matthew Mulica, who is leading the effort. Using customer data from Denver Water and Aurora Water overlaid with the Denver Regional Council of Governments UrbanSim forecasting tool, the Keystone Center is working to conduct model runs looking at the water demand reductions that could be achieved through various land use strategies. Alternate scenarios such as climate change impacts will be layered on as the project unfolds. Having actual, comparable data about growth and its water use implications could help overcome some of the disconnect between water providers and planning departments. The aim is not to rip out lawns from every property, says Mulica. “But for every person who would say, give me a better option, I will jump on it. I would like to frame it as choices.” Pausing, Mulica pointed to the calls for preservation of water for agriculture, for municipal growth and, of course, water in our streams. It’s politically savvy language, he says, but masks the central reality that Colorado has a zero-sum water game. “We are going to have to set some priorities, make some choices, and we need to do it in smart, strategic ways.” n See what your community’s comprehensive plan envisions for the coming years or find out about current public input opportunities by visiting your municipality’s website and locating the community planning and development section. AURORA’S ENVIRONMENTAL program supervisor Karen Hancock (left) led recent efforts to incorporate more sustainable water quality measures in the city’s land use planning processes. Don Elliott provided consultation to help Hancock bring about a more holistic approach. tionally, zoning only allowed a single use and set “maximum” densities, limiting how many houses per neighborhood or the size of buildings or developments per lot. That conventional approach has typically resulted in large lots, which usually mean big lawns that require lots of water, especially in summer when supplies are at their lowest. A shift occurred in the 1990s as developers and citizens began to seek out places where they could live but also work and shop and send their children to schools without driving to the other side of town. Mixed-use zoning enables developments to combine single-family homes, multifamily condos, shopping centers and office parks. It also results in more compact growth, enabling more flexible and conservative water use because of the higher densities of people and businesses and the mix of water demands by residential and commercial users. to give us a number,” says Bruce Hutchins, the district manager. “They said we could serve 9,300 single-family equivalents, but during drought, at three-quarters build-out we would be drying up the river in stretches. The town didn’t like that.” Instead, 8,300 single-family equivalents was determined to be the maximum supportable development that would still leave 60 cubic feet per second in the river at the confluence of the Fraser and Vasquez Creek, and the city council passed an ordinance making the growth barrier official. Today, the town is at 2,700 single-family equivalents. And growth outside Hutchins’ district’s boundaries, which centers around the ski area itself and is served by the Winter Park Water and Sanitation District, is limited due to protections on bordering federal land. a property that can be occupied by a lawn, or defining permitted grasses and plants that require less irrigation, often through what’s known as a model landscape ordinance. In the Roaring Fork Valley, which stretches from Aspen to Glenwood Springs, regional water provider Ruedi Water and Power Authority and local governments released a draft Regional Water Efficiency Plan in spring 2015, which includes a model landscape ordinance to help address water use amid steady change in land use and growth in the valley. While the format is still being developed, Mark Fuller, director of Ruedi Water and Power, says the model ordinance will be a set of standards with a checklist of options encouraging the use of native drought-tolerant vegetation, limiting turf coverage and types for parcels, and establishing landscape water budgets. According to the draft plan, the initiative could cost up to $10,000 to launch, but lead to annual water savings of 80 to 100 acre-feet per year by 2050. A water-efficient landscape certification program would rate efforts among categories such as businesses, schools or homes, providing further incentive to achieve water savings. WATER DEMAND FOR GROWTH expected in Carbondale (left) and other towns in the Roaring Fork Valley could be reduced by a regional initiative to improve water efficiency. Mark Fuller (right) of Reudi Reservoir and Power Authority says protecting the river, as the lifeblood of the local agriculture and recreation economies, is the effort’s guiding objective. “The idea is to try to bring some consistency to how landscaping is installed and maintained in the valley,” Fuller says. The efficiency report and the ordinance steer away from regulatory directives or mandates and instead focus on education, outreach and voluntary programs to boost efficiency and conservation. Whether that approach can reap meaningful conservation savings without also implementing statutory rules remains to be seen. To avoid implementing all-out restrictions, many communities are trying to achieve results through financial incentives. Aurora Water, for example, is testing the effectiveness of new fee structure, adopted in 2014, that rewards developers who elect to put in water-saving landscaping. For developers in Aurora, the savings are especially substantial for outdoor irrigation meters, which typically service commercial and residential common areas, and for which connection fees are tiered under the new system. The outdoor use portion of the fee, calculated on a square-footage basis, is slashed in half when xeric landscaping is installed instead of bluegrass. If a developer goes a step further, installing what the utility calls “z-zone” landscaping that will require no additional irrigation after an initial three-year establishment period, the fee can be refunded entirely after those three years. For every 10,000 square feet of landscaped area, the savings reaped could tally up to $27,500 for developers implementing the z-zone option. Within the first few months after adoption, the incentive compelled five out of six developers to pursue the z-zone, resulting in 730,000 square feet of landscaped ground that will not require a permanent water supply. Most of these types of efforts and ordinances are targeting new developments with the intent of establishing water-conscious lifestyles before people ever move into their homes. For existing buildings, cities instead provide incentives and rebates— for instance, to remove turf and replace with xeriscaping or to install water sensors that can override sprinklers if the ground is already sufficiently moist. Designed to capture and filter runoff through methods like bio swales or rain gardens, even grass buffers can serve this purpose, though their capacity is determined by the design and soils beneath the vegetation. Vegetated roof covers, like this one that tops the third-story garage at the Denver Botanic Gardens, can intercept, slow, and reduce rooftop runoff; at the same time they can reduce energy costs. New subdivisions can group their building structures on smaller lots within a portion of a property, while intentionally leaving open space to soak up stormwater. Various products like permeable interlocking pavement, porous asphalt, pervious concrete, grid and grass pavement all have great potential to reduce runoff across massive surface areas and, in some cases, to provide detention during flooding. real estate’s multiple listing service, or MLS, to highlight homes that include energy- and water-efficient amenities. In cities such as Portland, Oregon, and Seattle, Washington, “green” homes now draw higher sale prices. PACE UNIVERSITY’S TIFFANY ZEZULA led the 2013 Land Use Leadership Alliance workshop that Western Resource Advocates organized for Colorado leaders and land and water professionals. Zezula works nationally and says Colorado is ahead of the curve in connecting the two resource issues. In May 2015, a next class of communities took part in the Western Resource Advocates-sponsored land use workshop. Two years after the first course, several of the initial participants have taken strides to craft land use rules and codes that are building on the workshop’s lessons. “I think they’re getting it, and there has been great progress,” Beckwith says of the participating cities. “If you’re not discussing water in planning, it’s unlikely you’re going to make progress.” Of course, water constraints and costs are urging along action, whether towns and officials are engaged or not. Innovative tools that support the nexus of water management and land use make both environmental and financial sense, adds Lander, especially as water prices creep higher and supplies get scarcer. Each local success story shows other communities that the process and tools aren’t “so scary.” Policy challenges, from passing binding local and state laws to implementation and enforcement, certainly pose barriers, but progress is clearly being made and elected officials, developers, planners and water providers are all increasingly recognizing the benefits. One final element will help determine the pace and success of the push to integrate land use and water management: support and engagement from the people who live here. Lander points to Sterling Ranch and says the development’s inclusion of progressive water and land planning from the get-go, with its smaller lots and even smaller lawns, will ultimately test how and if an ingrained community conservation ethic develops among residents. Says Lander, “We’re really banking that values have changed.” n Visit the Pace University Land Use Law Center for additional case studies, resources, trainings and more at www.law.pace.edu/landuse. Attend the 2015 American Planning Association Colorado Conference September 30-October 2 in Steamboat, with tracks focused on the water and land use nexus. Learn more at apacolorado.org. n a bright spring morning in 2006, Jack McCormick came in from watering the horses outside his rural home in northwestern Douglas County and found his wife, Lois, perturbed. northwestern corner supply their projects with water that’s 100 percent renewable— replenished annually by snow and rain. Yet special districts, which supply water to many of Colorado’s unincorporated areas and some municipalities, lack authority under state law to decide where and how development unfolds within their boundaries. And none of these changes have helped the McCormicks, who have coped with declining groundwater levels since they bought their home in 1989 by drilling a new well and then lowering their pump four successive times. Although a renewable water supply is now in sight for them, it will come at a steep cost: Last November the McCormicks voted with 265 of their groundwater-dependent neighbors to join the Roxborough Water and Sanitation District, a Littletonbased water and sewer provider, for a fee that could climb to $60,000 per household. Roxborough is a small district that leases excess South Platte River water from the City of Aurora, then pipes it to some 3,400 homes and businesses southwest of Plum Valley Heights. Officials there say bringing on new ratepayers could help lower costs for existing customers. Still, Plum Valley Heights and its neighboring subdivisions will soon be buying water from an entity that had no involvement in their original design or approval. It’s an expensive, lastditch solution that would make most land and water planners cringe, and it begs the question: If Colorado’s population grows by three to four million people over the next few decades as the State Demographer’s Office projects, can land use planners and water providers work closely enough to ensure they’ll have the water they need to adequately support that new growth? Colorado’s Water Service Web While most Coloradans will find their water utility housed within the local city government, that’s not the case for all. Even Denver Water, which serves onequarter of the state’s residents, is an enterprise-zone, single-mission agency run by its own board, separate from the City of Denver and the other 19 municipalities to which it provides water service. In rural areas, customers are typically served by special districts, some of which provide only water and others that handle wastewater and other services, too. And while conservancy districts primarily serve agricultural customers or provide wholesale supplies to other water providers, some, such as Ute Water Conservancy District in Grand Junction, run their own municipal delivery systems. Existing utilities and water districts are often tasked with providing water to service new growth in their boundaries, while new districts are formed to provide service in places it doesn’t currently exist. In either case, state law requires that developers demonstrate adequate water supplies are available before their developments are approved. An interactive map of all the water entitiesin the state may be found here: http://lre-projects.com/ColoradoWaterEntities/ . SOURCE: GIS data courtesy of Leonard Rice Engineers, Inc.
HAROLD SMETHILLS (above, right) says he already has enough water to supply the entire 12,000-home Sterling Ranch development, which will be constructed over 20 years. Beorn Courtney (left) of Element Water Consulting helped Smethills blend a water-efficient design with a flexible water sharing and infrastructure plan for the development that will be approved in phases. In 2013, the Colorado Division of Water Resources reviewed 103 subdivision referrals and provided 295 other consultations to county planning offices on land use actions that involved water. by that authority, the Douglas County Commissioners in early 2015 signed off on Sterling Ranch’s first phase, which will include 660 detached homes and up to 140 townhomes. They did so after conducting the same detailed “sketch plan” and “plat” reviews of the project that they’ll do at each subsequent phase, which included signing off on detailed engineering drawings of the project’s water delivery system. The commissioners’ decision was eased by an offer Smethills made to sweeten the deal, pledging to sell 10 percent of the water he procures for each phase of Sterling Ranch to neighbors who—like the McCormicks in Plum Valley Heights—are eager to transition off of declining groundwater wells. Smethills estimates there are 700 such well owners on the periphery of Sterling Ranch, and he argues that the best way to cover the astronomical cost of bringing them a renewable water supply is—perhaps ironically—to build many more homes in northwest Douglas County and use the proceeds to pay for the necessary water infrastructure. Although Sterling Ranch’s plans to conserve water and share infrastructure with surrounding providers are creative and even ingenious, some wonder whether the fundamental form of the proposed development—single-family homes and townhomes on individual lots in the suburbs, far from the urban core—is the wrong sort of growth to be perpetuating given Colorado’s water constraints. “The broader question that people of the state need to ask is: ‘Should we be doing land development in an entirely different way because our water resources are so constrained?’” says Todd Bryan of the natural resources mediation and consulting firm CDR Associates. Bryan formerly worked at the Keystone Center, where in 2014 he helped launch the center’s Water and Growth Dialogue, aimed at assessing and quantifying the water-related implications of varying growth patterns. Results from this dialogue are expected by the end of 2015. “The goal of the project,” says Bryan, “is to change the question from ‘Where will we get the water to support new growth?’ to ‘If we knew the water use consequences of different land use choices, might we make different choices?’” n Find information about Colorado’s special districts and their service areas and plans at sdaco.org. The West is simultaneously the driest and fastest growing region in the U.S. Itâ&#x20AC;&#x2122;s important that we grow in a way that is smart. Western Resource Advocates is working on several fronts to integrate land use and water planning to decrease the water footprint of new development so we can meet the needs of growing communities while also protecting our amazing rivers and streams. Land Use Planning for Water Efficiency Over the past two years, WRA has hosted a series of workshops with water utility staff, land use planners, and local elected officials. Working closely with these partners, weâ&#x20AC;&#x2122;re helping make new development more water-smart. Publication of the Colorado Foundation for Water Educationâ&#x20AC;&#x2122;s Headwaters magazine is made possible by the generous support of sponsors and advertisers. We would like to extend our appreciation and thanks to these sponsors for contributing financially to this issue.